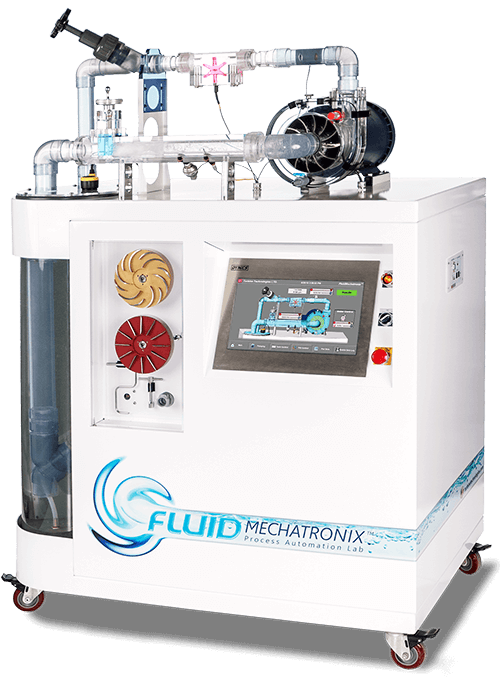 FLUIDMechatronix™ is a state-of-the-art process automation and pumps teaching system. It's constructed with clear-view flow path components that dramatically increase visual learning and comprehension. Students actually get to see how their inputs cause dynamic changes in a fluid system. Utilizing a Rockwell Automation PAC, along with a large format touch-screen HMI, students are presented with curriculum-driven skill building activities that include process control and programming of tank levels, flow rates, pressures/suction, temperature and mixing. Many characteristics of fluid flow can be viewed and demonstrated, including: cavitation effects on pumps & motors, Net Positive Suction Head (NPSH) calculations, head loss calculations, valve throttling, etc. Rockwell's Automation Studio 5000™ and FactoryTalk ViewME®v8.0 graphically present the "factory floor", offering students direct programming and operating experience with the most current industrial automation hardware and software. Another unique feature includes a strobe lighting unit that highlights boundary layer activity in the centrifugal pump impeller, actually stopping cavitation bubbles and related flow phenomenon "in their tracks", so you can see them! A clear-view flow circuit allows students to view multiple sensor types, pump and valve cavitation, valving, pump impellers, etc. A side mounted "Grace Port" also allows for HDMI interface and overhead projection of the HMI display- for large group participation. And, on-board Ethernet offers opportunities in remote learning and data sharing. FLUIDMechatronix™ allows students to study centrifugal pump performance curves, head/discharge curves, flow rate/torque correlations, witness impeller boundary layer conditions, and view cavitation. The ability to test student-designed impeller performance is a major feature of this system. Have your students design their own custom impellers, predict performance and actually verify results. FLUIDMechatronix™ is the elegant result of collaboration between automation industry professionals and our educational advisory group. The system offers students state of the art devices and software that work in harmony to provide a world-class education in process automation and pumping. Backed with a comprehensive curriculum, these skills are readily transferable to current and future industrial needs. Contact us for detailed specifications and a free curriculum sample. Click image to download PDF curriculum sample. The full curriculum is provided free of charge with the purchase of the FLUIDMechatronixTM system.